How to Restore Only SMS on iPhone (iOS 12 Supported)? I've recently been having some software glitches on my iPhone 6s (ios11.1.2). To fix this issue, I've had to set my phone up as a new iPhone and as a result I've lost some old text messages. Which I'm hoping to somehow restore. I have these messages backed up both to my iCloud and my iTunes, but the problem is I can't simply restore the backup as I get the software glitch again. Does anyone know a way that I can transfer these messages to my phone? One problem with the regular iTunes/iCloud backup function is that it has no utility or option for the restore of some certain data that many users really need. To be specific, restore of only SMS messages appears to be impossible through an iTunes backup or an iCloud backup. 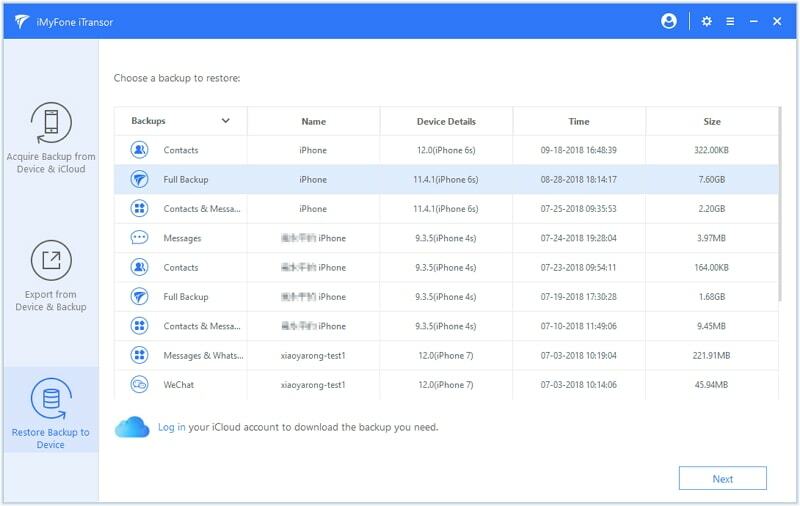 But this article will resolve that issue - 3 ways about how to restore only SMS from iTunes/iCloud backup to iPhone will be discussed and they work for even iOS 12. How to Restore Only SMS Messages on iPhone from iTunes backup? How to Restore Only SMS Messages on iPhone from iCloud backup? 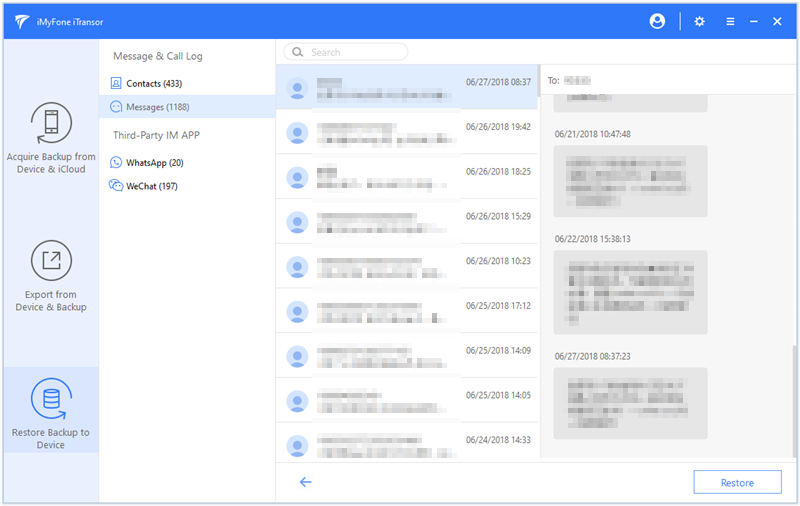 How to Backup and Restore SMS Only without Affecting Other Data? It can restore only the SMS messages from iTunes and iCloud backups, including the videos, audios and photos attached in message conversations. Besides SMS, it supports to restore only WhatsApp, contacts or WeChat data from previous backups, and it will support more in the future updates. The current data on your iPhone will not be affected after restore. It can back up iPhone data (completely or selectively) for FREE. Compatible with iOS 12 and earlier versions. After run the iPhone backup and restore tool and click "Restore Backup to Device", you will see all the iTunes backups on the computer. Choose one according to the size and time and click "Next". 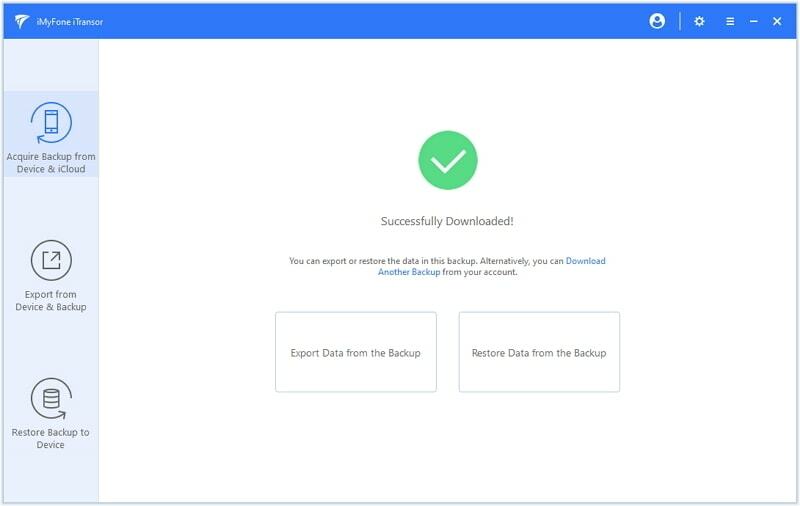 Then iTransor will offer 2 options: "Restore Full Backup" and "Restore Partial Backup", Click Restore Partial Backup and you can choose the data type(s) you need to restore. Check Messages in our case. Then connect your iPhone to the software. You can choose "Preview & Restore" if you're not sure the SMS content in the backup. Then iTransor will scan the SMS data in your backup and display them for you to view. 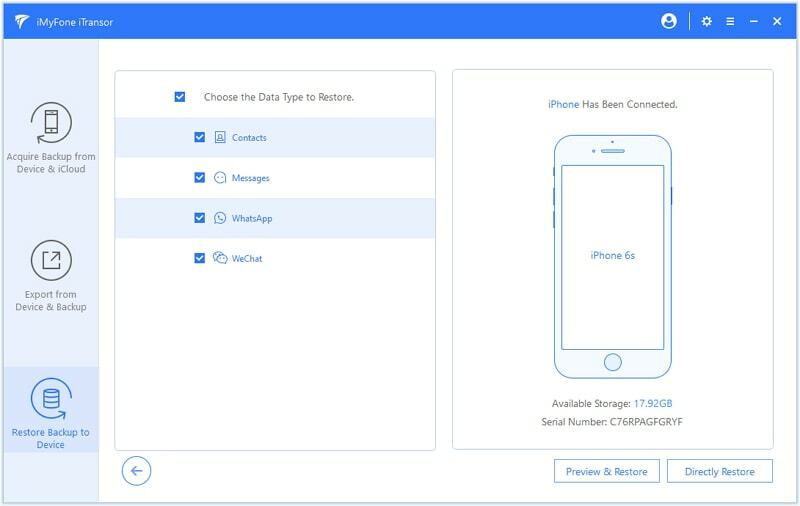 Click Restore button and choose to Merge or Replace the SMS data on your iPhone with the SMS you just previewed. Then the software will start the restore process and you will be noted after the restore is finished. 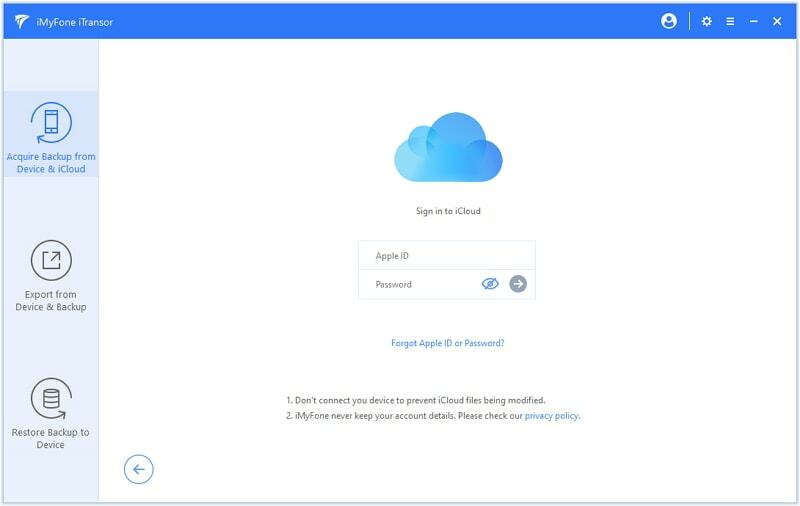 Log into your iCloud account by clicking the "Acquire Backup from Device & iCloud" and then choose "Download iCloud Backup" to log in your iCloud backup. Choose the backup you want to restore SMS from. Click Next to start the download process. The times it needs depends on the size of the iCloud backup. 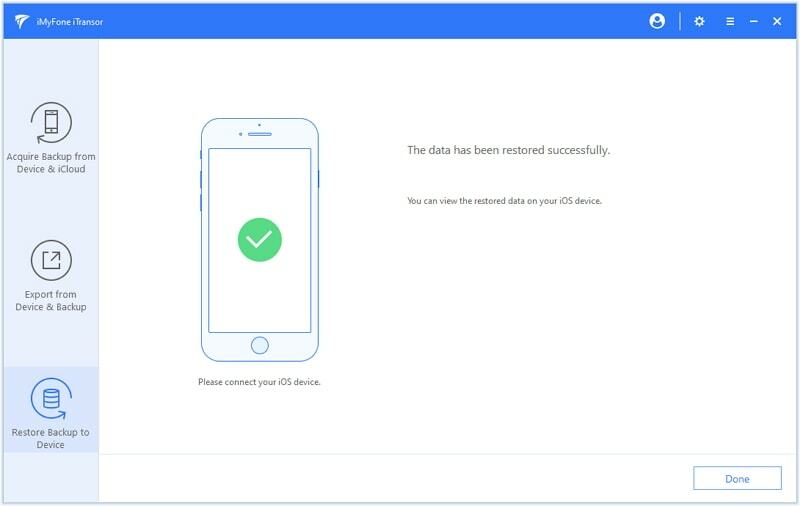 After downloading the iCloud backup successfully, you can click "Restore Data from the Backup" and the following steps are same with Restore Only SMS on iPhone from iTunes Backups. 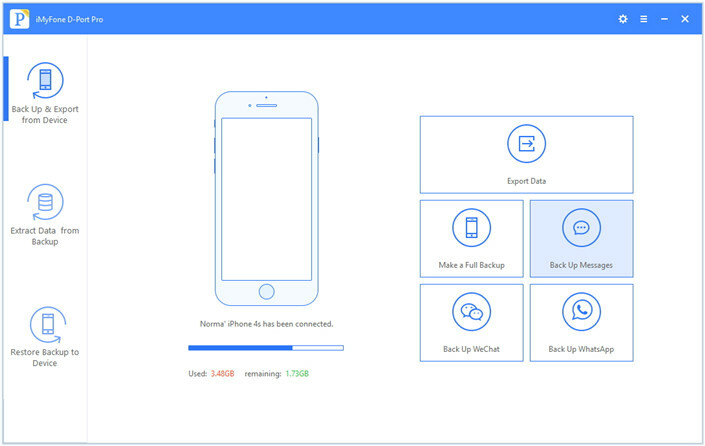 With iMyFone iTransor you can back up SMS on iPhone only and then restore the backup anytime you need it to another iOS device. To do this, choose "Acquire Backup from Device & iCloud" in the left panel to back up SMS on iPhone for free. When it ends, you will be notified that your messages have been backed up successfully. 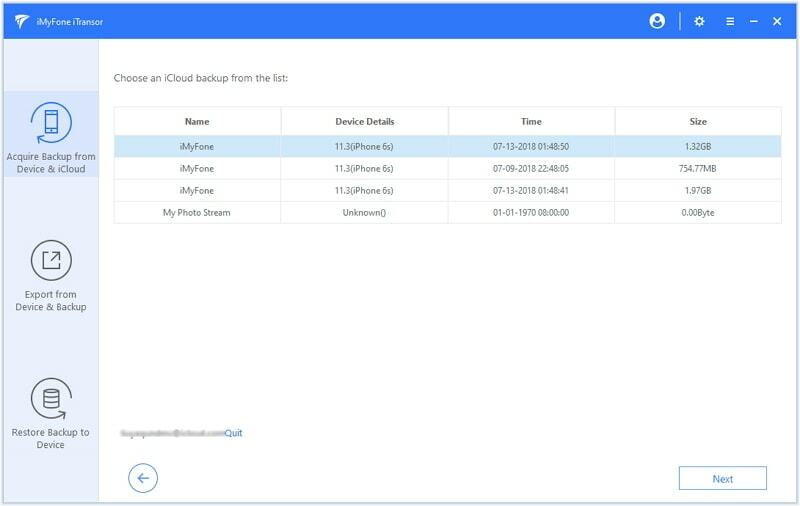 When you need to restore the separate Message backup, you can go to the tab of "Restore Backup to Device" and then restore the backup with similar steps like the above parts we discussed. Choose the SMS backup and then follow the on-screen instructions to restore. By using the iMyFone iTransor software you have solved a problem that has plagued iPhone users who have tried copying messages by every possible means. It seems like something that would be an obvious part of the process when switching between devices, but only iMyFone D-Port Pro makes it intuitive and easy to really do so. Try the Free Trial version now and enjoy the benefits it offers!